El Chessico – First Leg to Hammersmith! 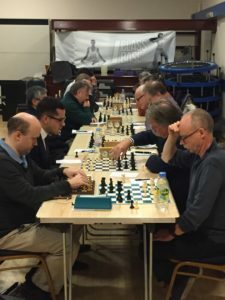 In one of the most highly-anticipated games of chess since June, the Titans of Hammersmith Chess Club took on the relative Royalty of London chess, Battersea Chess Club in the first leg of a double header modestly dubbed “El Chessico” (a pop culture reference to an obscure game of football somewhere in Spain) last night. Your correspondent is proud to report that Hammersmith achieved victory in an-evenly matched game, by 7 boards to 5. This being the home leg we were delighted to welcome Battersea to our Summer venue, the Albion Pub on Hammersmith Road. Paul Westenhanner achieving a creditable draw on top board against Carsten; John Wooley drawing on board 5 against a much stronger opponent; Jorge Hinolan with a terrific win on his Hammersmith debut; and Danny Gordon also securing victory on his debut for the club. Fantastic effort chaps, and thanks to everyone who turned out. Attention now turns to the return leg next Tuesday 26th where, due to popular demand, we have agreed to widen the game to 14 boards!! It will be a fantastic sight watching 28 players engaged in battle across the board. As Battersea are hosting we will have the added difficulty of going “saaf” of the river, however I’m confident we can dig deep and overcome this disadvantage! We go again!! A reminder – Monday 25th sees us hosting WIM Sue Maroroa at the Albion for a simultaneous display. If you’ve not done so already, please get in touch to confirm your attendance. It’ll be a great opportunity to play against a top class opponent! Author HammerPosted on July 19, 2016 Categories Club Updates, GamesLeave a comment on El Chessico – First Leg to Hammersmith! Save the dates!! We have agreed to hold a 12-board double-header against Battersea Chess Club in July, with one game at our Summer venue in The Albion on Monday 18th, followed by a game at Battersea’s home venue on Tuesday 26th. 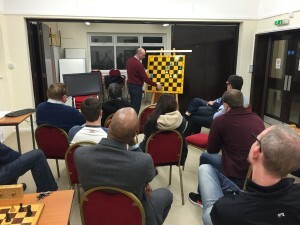 It’s a great opportunity to get a chess fix during the close season, and should be a competitive pair of games against London’s oldest chess club. The games will be ECF graded and we’ll be playing London League (Quick Play) rules on all boards – so no adjournments. A great opportunity for all members, including those new to competitive chess. We have asked Battersea to put out an even spread of graded players so that we can have some relatively even match ups. It’s an open invite and free to all members – if you’re interested in playing please leave a message below, drop us an email, or contact your team captain. Promises to be a great pair of evenings with some competitive chess which we’re really looking forward to! A treat from the archives this evening – Club Secretary Mike Mackenzie managed to dig out this classic from 1975 – the same year we saw the Thriller in Manilla, Thatcher became leader of the Tories, and Aston Villa were even a good club back then, winning the League Cup final! Reigning Club Champion (since 1962!!) John Rogers – rated 200 ECF! – faced our late Chairman John White – rated 148 ECF – in the deciding game of the Club Championship. On paper an easy victory for John Rogers and should’ve been a 13th straight Club Championship for him. Could the young upstart unseat him? Played some games at your club to prove you know your way round the board – Done. Now you’re ready to play some London League chess, of course! That’s where it started for me 3 years ago. It’s been at times bewildering, exhilarating, and sometimes just downright confusing (How did I just lose on time?? ), but I hope this post serves as a reasonable guide to assuage any doubts for those thinking about taking the plunge. My first game was a memorable ride. Turning up at the ascribed venue near Euston station, I’d arrived early – eager to impress, clearly! – but it wasn’t hard to spot the chess crowd milling around. Nervous tension palpable, a slight sense of foreboding overcame me – how would I remember to write down each move correctly (harder than you might think when the board is un-annotated and you’re playing black! ), press the clock, whilst trying not to embarrass myself on the board? Surely all new players go through the same set of thoughts, fears and emotions, I tried to reassure myself. Thankfully my team captain was already there and helpfully pointed out where I should be sitting. The respective captains toss a coin to decide who picks which colour on the top board. The other boards then alternate down from that, as does the slow/quick play timing. It’s worth reminding yourself of the difference in the timing regimes and other rules of play before you start – I’ve won and lost cheaply through not knowing the details properly. With my opponent and I in situ and apparently ready to go, there’s the awkward wait for the allotted start time to arrive. Do you engage your opponent in conversation? It doesn’t appear to be the done thing but some are more receptive to it than others. One thing that’s useful to do at this point is ensure you have written your opponents name and the other details of the match down correctly on your match sheet. A general murmur of excitement builds, the home captain might make a quick announcement about mobile phones, and you’re ready to start. A quick shake of your opponents hand – mumble a “good luck” while you do it – and you’re off. I will admit, I spent most of my first game panicking about making a spectacular blunder. Check, double check, triple check every move and position – diagonals for bishops, potential forks for knights, discovered checks, any obvious intermezzos I’ve missed? The stress level and heart rate were both pretty high. I can’t really remember too much of the detail but after about 4 moves I was way off any openings I knew about (admittedly not saying much, but my opponent employed the English opening – 1.c4, rare enough for a beginner like me I think). Somehow I was able to convince myself it’s fine; just play your game and don’t worry too much about anything else. I don’t remember the sequence of moves or my thought process at the time, but I ended up with an advanced knight threatening the squares near his King, with my Queen poised to move forward next move and check him. Surely this couldn’t be check mate, I thought, as I sat there pondering the combinations and desperately hoping my opponent wouldn’t make the obvious defensive move to repel me? The excitement and pressure at a moment like that can be quite intense. My mouth was dry, my right leg hopelessly twitching in nervous response to the sudden burst of adrenaline as I contemplated victory against a respectably strong player in my maiden game for my club. The overriding thought was to double, triple, quadruple check to ensure I wasn’t leaving the back door open to a disastrous failed attack. Breathe and relax, write your move down and await your opponents response. One notable difference in face to face chess versus that played over the internet or on my phone, is that your opponent nearly always finds the right move to deny your thrilling combination. Your considered sacrifice resolves to vain, inglorious defeat. You quickly learn to leave your Mikhail Tal impression at home and more often play the dull – but safe – move. On balance this is where results are found in the London League. Very rarely does the frivolous attack lead to victory. Beginners luck perhaps but my opponent failed to spot the threat, making a move of little consequence. I tried – and mostly failed – to nonchalantly advance my Queen, dispatching my opponents King with aplomb. I stumbled slightly in announcing “check mate” (as is de rigour when one achieves it), not entirely convinced of my own victory. After a brief pause to assess the position my opponent looked up and mumbled “Uhm… I didn’t spot that”, conceding defeat with the offer of a hand to shake. What normally passes after a game has finished is the stilted assessment by bother players in hushed tones, offering advice or pointing out where victory/defeat was achieved. Aside from annoying your neighbouring players (and thus often having to de-camp to the nearest empty room), these little chess vignettes can be remarkably useful in understanding how you played, where you could have made better moves, or what the expected response to a certain opening was. It can be a good opportunity to get into the mind of your opponent too – they will often have assessed a situation quite differently to what you may have. On occasion I’ve had my opponent point out where I missed an opportunity for check-mate. Now that is frustrating! As a relatively hardened pro I now tend to shy away from assessing my defeats with my opponent – pretty poor on my part this – but I do enjoy replaying the occasional game that was particularly enjoyable and close fought. I prefer to analyse my games a few days later with a book or two and perhaps a computer to aide me. I’ve found it one of the best ways to learn opening theory and spot holes or missed opportunities in my performance – though admittedly my current grade (92 ECF) does not reflect this! Regardless of the outcome you can always be sure of learning something about the game in a face to face match. It may not be the fluid attacking combo you were hoping for, executing that opening you’ve been studying for weeks, or ruining your opponent in a 20-move blitz of style and sophistication, but even old pros get a bit of luck occasionally. You can see my full “analysis” of that game here. Enjoy! Hammersmith v Fulham Juniors: 6-6 thriller!!! Hammersmith had the pleasure of taking on Fulham Juniors this week at their home venue, the Brunswick Club on Haldane Road. The Juniors are a truly thriving club. Under the inspired leadership of club manager Paul, they regularly see over 40 youngsters turn up to events, and have on occasion had over 50 turn up! We were delighted to have the chance to play some local up and coming masters!! Despite the vagaries of the London Underground District Line causing a default on one board in the first game, we were able to produce a strong team over 6 boards for a 2-game event. It finished 6-6 overall, which is a credit to the youngsters – this after some unlucky performances saw at least 2 won positions end up lost for Fulham. Credit to Adam on our team for recovering well in both games after getting stuffed out of sight for most of the match! And a very good game from Xavier in the second round defeating Chris. Author HammerPosted on April 21, 2016 April 21, 2016 Categories Club Updates, GamesLeave a comment on Hammersmith v Fulham Juniors: 6-6 thriller!!! By Club Secretary, Mike Mackenzie. Monday 29th February – The club took advantage of a match-free evening at our home venue to host another training session run by club Chairman, Bajrush Kelmendi. The previous week’s session proved a great success and was very well attended, hence we had another good turnout tonight. Opening theory and Endgames were the order of the day, admirably presented by Bajrush. He also covered Pawn structures in depth, passed pawns, isolated and doubled pawns, which was enlightening. Bajrush then shifted to a couple of his own personal games that were good examples of the evenings themes. 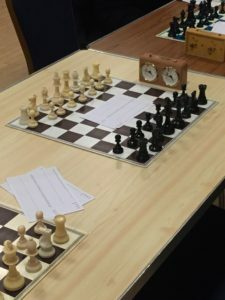 Our Chairman, on closing the event, revealed that he had a special opening of his own creation which he uses against all opponents when playing White. What is it? Well, you’ll have to play him and draw the Black pieces to find out! Members were so impressed with it that one team captain is going to adopt the setup next time he has white!! I think we need to patent this opening and give it a name. Therefore, anyone that attended the session please think of a suitable name – suggestions in the comments at the bottom of the article, or by email. I will start off by naming it “The Mixed Grill”!! Very suitable I believe. Streatham out graded us on all boards by quite a long way. Brian Dodgeon playing board 1 (and as stand-in Captain) was the hero of the night, gaining a very creditable draw with a 164!! There were 2 adjournments and we defaulted board 8. Result 6.5-0.5 in favour of Streatham. The club exercised its first Committee Meeting of the year. All issues discussed are included in the minutes for the meeting. This was followed by a brilliant analytical display from Carsten Pedersen of 3 games submitted by members from the Simultaneous against GM Chris Ward earlier in the year. We had 13 people turn out, full of questions, comments and suggestions for Carsten to answer. 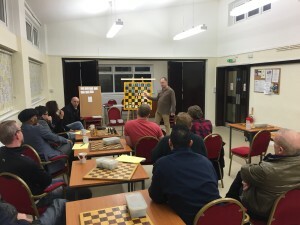 First up was Chris Moore playing the French, with Chris Ward demonstrating why he is a GM! Even Carsten could not save the game in the post-mortem!! Your author was up next, playing my favoured Modern Benoni opening (which I suggested to the GM I would play if he opened up with 1.d4, which he duly did). I felt I played the opening quite well but Carsten pointed out some weak moves which gave Chris the advantage. From there it was only going to go one way. Last up was Dave Lambert playing the Nimzo-Indian, an opening Chris has written 3 books on. Dave held his position well making very few bad moves, eventually being forced into retirement – death by a thousand cuts! Carsten then gave a few useful tips: Prepare for pawn storms when castling on opposite sides; Backward diagonal moves are always hard to foresee; Beware of Alekhine’s cannon – a Queen on d1, a Rook on d2, and another Rook on d3. A loud round of applause was the order of the day for such a fine display. Well done Carsten! He has requested feedback to assist him with future demonstrations – leave your comments below. 6 wins from 7 boards for Hammersmith in this game – an excellent result with the last game adjourned. 3 matches remain in the division. If Hammersmith can secure 3 more wins we are guaranteed promotion to Division 1. A great win for Hammersmith against our main rivals for the Division title. We now lead the division by a point with 2 games left. This game was on a knife edge at 1.5-1.5, with Dan Rugman’s game to complete. A pawn up, it looked to be heading for an adjournment until Dan unleashed a great mating attack which his opponent fell straight into. With the win on the last board, Hammersmith won the game 2.5-1.5. Thanks to all players in a busy month of games – good luck with our April fixtures! Blitz Tournament & Training Evenings – Save the Dates! 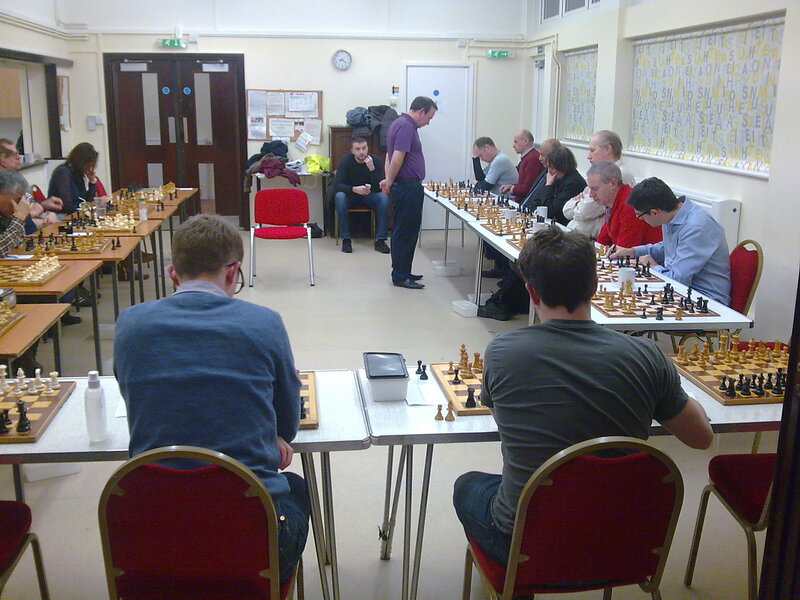 We are pleased to announce that on Monday 4th April we will host a 5-round Swiss Blitz tournament at the club, with time controls between 10 and 15 mins. It should be a great evening of fast, competitive chess! We’ll aim to start at about 8pm, but club will be open as usual from 7.30pm. Content of future training sessions to be confirmed nearer the time. If you can’t make a Monday evening at our club venue, we also run a free weekly session at Hammersmith Library (on Shepherds Bush Road, 2 mins from tube station) every Wednesday from 6-8pm. It’s hosted by a player or two from the club with a number of boards, and anyone is welcome to come up and try their hand at a game. The evenings have proven very popular of late, particularly with younger players. It’s a great way to get some hands on experience of the game! We are looking to shortly expand into Shepherds Bush and Kensington Libraries – more on that soon! Do come along to these events if you can – you’ll be very welcome! Author HammerPosted on March 24, 2016 March 25, 2016 Categories Club Updates, Games, Training & TheoryLeave a comment on Blitz Tournament & Training Evenings – Save the Dates! Why do I play better against stronger players? This is a question that keeps many club chess players awake at night – especially if they are graded, like yours truly, between 120-140 ECF. This is something we have all experienced at some stage of our chess odyssey. The circumstances when these thoughts appear are often the same. They usually occur after securing a heroic draw against a 180-rated opponent when you had the best of the game. This is then followed by a horrible and deserved loss or draw to a sub-120 graded player in your next match. How can I play so well and soar so high, then sink so low? This is the joy of competitive club chess. It allows you to dream and then cruelly dishes out a dose of reality. This has happened many times to me in my lowly chess career and hence the need to address this question in a public forum. After sufficient navel-gazing time I have come to the conclusion that the same factors are involved in both games. Obviously you may say, but please let me explain why. To use an excellent analogy, I will call it the “Leicester City Chess Rules” (LCCR). 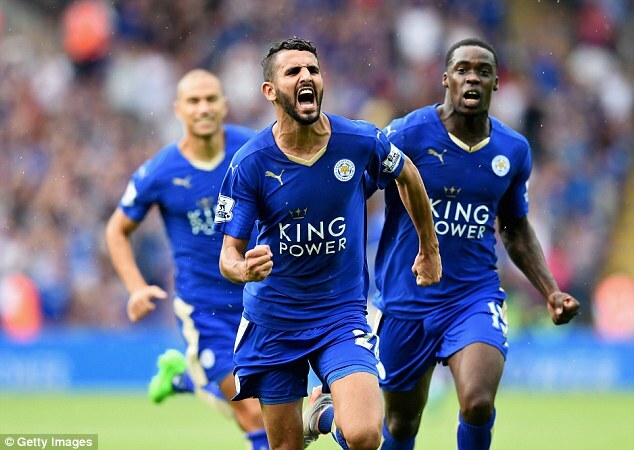 Nobody gave Leicester City a chance to escape relegation last season or to win the Premier League this season. Indeed, the odds at the start of this season of them winning the league were 5000-1! Will LCCR help you outfox your opponents? Your frame of mind. I am playing a 180 – he/she should crush me – so a loss is no disgrace. I play without pressure. Nobody expects me to win, or even draw. Your opponent’s frame of mind. All the pressure is on them. They have the high grade – they should crush me. I am sawdust compared to their stardust. This can induce a false sense of security and lead to risk-taking. Something they would never entertain against a peer. The time factor. I have found that the liberating effect of no expectation translates into excellent clock management. You play sensible and logical moves – avoiding at all costs a tactical melee. This means you are often well up on the clock. Time pressure is your high-grade opponent’s problem, not yours. As the game progresses – the effect that a loss or draw has on their grade increasingly comes in to play. The pressure that comes from the results on other boards. This is something that can affect your opponent as other results come in. These are the five critical factors that influence the course of the game. Unfortunately, they also apply equally – but not so favourably – to your game with sub-120 graded opponents. Your frame of mind. I should win; I out grade them by 20 points – the win is in the bag. So wrong in every way – Caissa has many ways to dish out a dose of humble pie! Your opponents frame of mind. They play without fear – they do not know about your 180-graded heroics. I am just another opponent. The time factor. My clock management is far worse. I spend too much time striving for an advantage – when simple moves would be better. I must and will win. This thought process inevitably results in defeat. As the game progresses, the realisation that you may actually lose increasingly weighs on you. This is compounded by the thought of lost grading points. The match situation. Your team needs a win – you need a win – this ups the ante and again clouds your thought process and logic. Your grade will take care of itself. The game on the board should be your focus. Finally, play your game, not the match. This may be a Boycott approach but chess is about your game not your teammates. This may be selfish but it will help focus your mind on what you can actually influence. Of course, supporting your team once your game has finished is essential. Adoption of the LCCR may not make you a better player, but it will give you peace of mind. Playing without pressure means you will play better. So, do you play better against stronger players? My answer on balance is probably yes, but the flip-side is that your results against peers tend to remain the same for the reasons outlined above. If you can translate that form against the very strong players to your usual graded opponents then you may be one step nearer to unlocking the mystery of that board game called Chess. By our London League 4 Captain, John White. 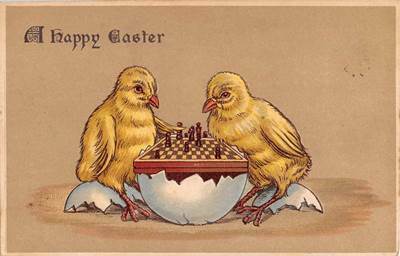 Author HammerPosted on March 1, 2016 March 25, 2016 Categories Games, General Chess2 Comments on Why do I play better against stronger players? As the only victor in the recent Simultaneous against Chris Ward, Hammersmith’s Danish wizard Carsten Pedersen has generously provided us with his analysis of that game. The insight is a real treat and makes for a fascinating read. As you might expect from two top players, some of the lines are tricky to follow, though Carsten has done really well in explaining the logic behind them. I’m pleased to say there is even the occasional (semi) blunder in there! A terrific read – hope you enjoy it.